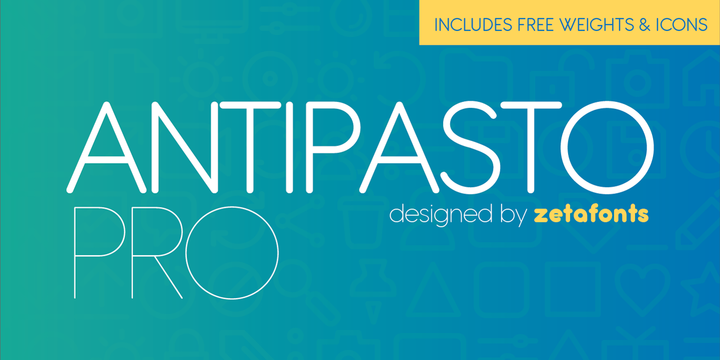 Antipasto Pro is a contemporary sans serif typeface created by Cosimo Lorenzo Pancini and published by Zetafonts which is available in 17 styles, 9 weights (from Hairline to XBold), multiweight icons and language support. It merge well on branding, headline, logo, magazine, packaging but also on web. Have fun! Price: starting from $29,00 for one font to $125,00 for all 17 fonts. A font description published on Friday, June 23rd, 2017 in Cosimo Lorenzo Pancini, Fonts, Zetafonts by Alexandra that has 3,660 views.